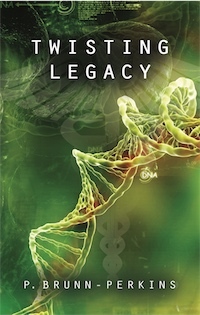 Compulsively readable and deeply heartfelt, Twisting Legacy casts a poignant, illuminating light on the scourge of a fatal genetic disease and its impact on three generations of a family. Despite deception by the protagonist, challenges, and sacrifices, courage prevails, love endures, and hope remains. Professional pianist, Ava Skinner, is living a near-idyllic life with her wealthy husband, Langdon, in their Naples, Florida, mansion on Gulf Shore Drive, until perplexing medical symptoms cause her to feel and behave uncharacteristically. When a pernicious dread of the future invades her every waking thought, desperation and suspicion drive her back to the orphanage where she was reared to search for information about her family, especially a medical history. In a dusty file, she discovers an unopened letter from her mother, Isabella, who writes about a tragic family legacy. When a doctor confirms Ava's worst fears and reveals a second shocking surprise, she hides the dreadful secrets from her overburdened husband and makes plans for her future. Wrestling with a world that is collapsing around her, burdened with lies and guilt, and wanting to remove herself from her husband's observant eye, Ava flees to Maracaibo, Venezuela, on the pretext of gathering information about her family. She is frantic to conceal her worsening symptoms from her husband and determined to prevent him from finding out about the two life-and-death secrets that she shares with no one and vows to take to her grave. In Maracaibo, Venezuela, Ava searches for living relatives and digs into her familial background for information about the fatal hereditary disease that rampaged through three generations of her family as its members migrated from Venezuela to Florida. She locates a cousin in the terminal stage of the family illness and pitches in to help his wife, Mariella, care for him. Despite losing her home, her previous full-time job, and any hope for the future with her terminally-ill husband, poverty-stricken Mariela, who lives in a one-room shack in an alley, has surrendered everything in the name of love. She is the yardstick by which Ava measures her own fortitude. As Ava's journey continues, she becomes intimate with the obstacles and challenges once endured by some members of her family. Yet even in the wake of her deception and extreme sacrifice, courage wins out, love endures, and hope remains. The story, set in two dissimilar cultures--Naples, Florida, and Maracaibo, Venezuela--provides contrast between the rich and the poor, touches on the plight of migrant farm workers, and offers readers a realistic picture of the psychological burdens borne by people suffering from chronic illness. Most important, Twisting Legacy puts a face on a little-known, fatal disease, including the progress made in finding the causative gene, managing the illness, developing in-utero and at-risk testing, and counseling individuals at risk. Despite progress, there is still no cure. Compulsively readable and deeply heartfelt, Twisting Legacy casts a poignant, illuminating light on the scourge of one particular genetic disease and the courageous people who are forced--every day--to deal with its inhumane ravages. The author is a graduate of Cornell University-New York Hospital School of Nursing. She completed the coursework for an M.A. in Community Psychology at Central CT State University. The mother of three daughters, she lives between Naples, FL, and Southington, CT, with her dog, Daisy.